First of all thanks to Qvist for making these lists. That must be quite some effort to present all the cards on your own! Also thanks muenstercheese for letting me do the top half of the $3 cards! Like every year since its release, Market Square drops down in the rankings. It barely made it to the top half, dropping 7 places. Doctor wins one rank and has the third highest standard deviation from $3 cost list (after Loan and Develop). especially Silver gainers like Amulet, Squire, Lucky Coin and so on. Changeling is even more fun with with Masterpiece and Teasure Hunter. You probably don't want too many Changelings though because a hand full of Changelings won't do anything. and reducing the handsize by 1 in the meantime. Having said that, Warehouse is good in Slogs and with Tunnel. Dropping 10 places, Watchtower is the biggest loser of the list. Scheme is another big loser of the list compared to last year. Often there are just better things to do with $3 at the early stages of the game and later on you often don't need the Scheme ability anymore. In its second appearance in the lists Chariot Race climbs up 8 places. 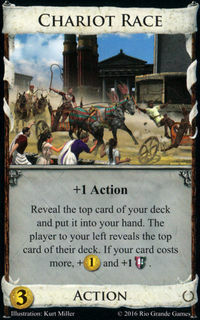 Chariot Race can be a good source for both VP and money which is why sometimes it is the dominant strategy. Plan wins 3 places and is 4 places lower in the unweighted average. 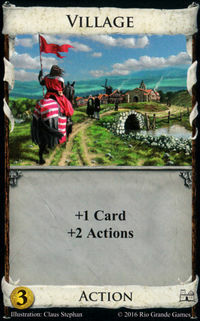 One of the new Villages from Nocturne. The turn after you bought Ghost Town starts as if you would have played a Lost City, which is pretty good. It can also be bought to save your next turn from terminal collision (e.g. in turn 3 if you opened with 2 terminals and don't see either of them). Enchantress' deferred draw adds reliabilty to the deck. The attack can also hurt a lot, especially early on. When you have plenty of action cards in your deck you can often play around the attack. Don't forget that the attack does not affect the text below a deviding line. So you still get VP when buying a Victory card with an enchanted Groundskeeper and you can still exchange an enchanted Page. Catapult is a big winner. It was even voted first once. Trashing and attacking at the same time is just great. Later on you can trash Rocks or Silvers to make the attack one of the strongest in the game. Rocks don't get uncovered most of the time though. Lookout continues to improve its position in the list. The cycling effect that is added to the trashing is a powerful thing not to be underestimated. I would not be surpirsed to see Lookout climb even a bit further. It got voted first once. Being stable throughout all the previous rankings, Hermit loses 4 places this year. Hermit's trashing cababilites are limited, but the fact that you can decide to exchange it for a Madman is great. 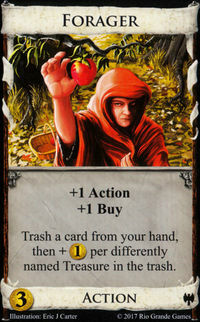 You often have to decide if you want to buy another card from the supply, or rather gain a Madman by not buying anything. You can buy an Event and still get Madman, which is a powerful interaction to keep in mind. Another thing to be aware of is the Hermit/Scheme trick. You can topdeck Hermit with Scheme and still get a Madman! Village was there right from the start and even wins 1 spot against the newcomers. Dungeon wins 3 places and 14.3pp, That's quite a boost. Dungeon is comparable to Warehouse, but it's better. The on-play effect also reduced your hand size by one but the duration effect doesn't. 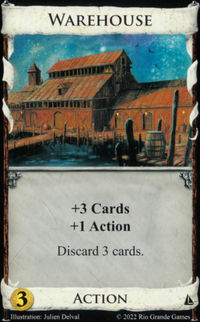 It cycles four cards in total whereas Warehouse only cycles three. Starting at #5 2012 and even improving to #4 before being pushed back to #6 and then #9, Menagerie drops out of the top 10 for the first time this year. Black Market wins one place and was voted first once. 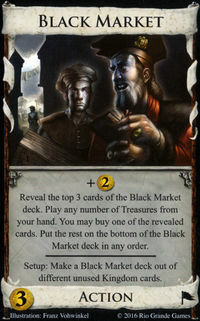 Black Market can be a swingy card at times when you find a really powerful card like Mountebank, Goons, City Quarter or sometimes Outpost. It often leads to long games with lots of pick ups from the Black Market deck. The deck it shuffled once you are through it, so remembering the order of the cards doesnt' help. Keeping some cards in mind you might be interested in can be helpful though. Another card that drops out of the top ten is Forager. It has a surprisingly high standard deviation this time, too. Despite only trashing one card, Forager is a powerful trasher because it's nonterminal. It will be mostly worth $0 or $1 at the start but often gets up to bigger numbers later. Welcome to the elite, Bonfire! After already climbing 6 places in the last ranking, Bonfire makes another jump and is now in the top 10. 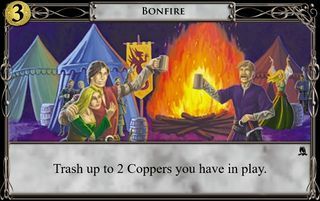 Bonfire is a very quick way of trashing your coppers. To reach its full potential, you want to pair it with something that can rid of Esates/Shelters (or rather Overgrown Estate and Hovel). 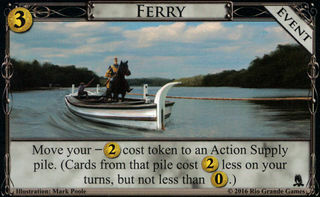 Ferry loses 2 ranks and has the highest standard deviation of the top 10 cards. Gear stays where it was and was voted first two times. Gear is a good big money enabler because the Save effect lets you distribute your treasures nicely. It's also good in engines when you can add some reliabilty to your deck by setting aside a card to help you kick off your next turn. The spots at the top are tight, so climbing 4 places and gaining 7.9pp is quite a big jump forward for Amulet. 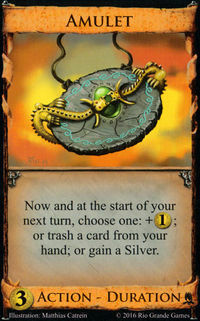 No surprise though, as it is a strong trasher and the the flexibility of Amulet is amazing. It got voted first once. 7, 6, 5, 5, 6, 6 are the positions of Swindler in the rankings over the years. 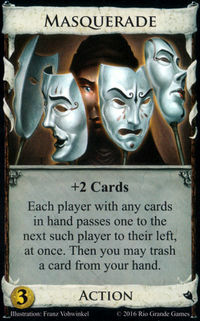 There is no variance, not something you can say about the effect of Swindler in the games. It was voted first twice. Fishing Village loses one rank and was voted first once. 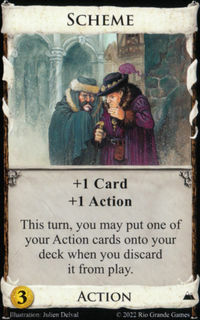 It provides $2 along with +3 actions over 2 turns for the mere cost of a Silver. 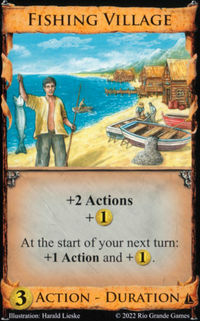 Starting your turn with 2 actions from a Fishing Village in play adds additional robustnuss to your deck because you don't have to have a Village in your starting hand to kick off your typical Village / Smithy variant deck. However if the draw is weak and another Village is available that doesn't reduce your hand size you might want to get that over Fishing Village. Despite not getting voted first even once, Urchin wins one rank. Urchins attack is not very fearsome, but the effect of Mercenary is. You often want to open Urchin/Urchin (unless there is an even more powerful trasher) and hope to collide them on turn 3 or 4 (it's 45.45% to do so). 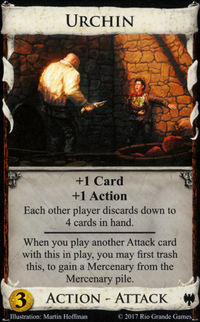 The player who collides them early is ahead most of the time which makes it Urchin a card of a somewhat high variance. Steward defends his place on the podium and was voted first once. 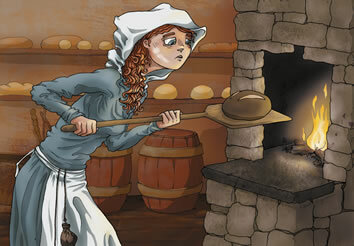 Steward is a powerful trasher early on and provides economy and draw later on. It is even more awesome if there are good $2s to pick up, because that's what you are left with most of the time if you trash 2 cards in the early-game. 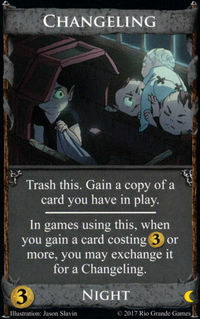 You can also use it to hit $5 on turn 3 and 4 but most of the time trashing is preferable. The biggest difference (6.7pp) between two consecutive cards is between place 3 and 2 which means the top two cards are in their own league. It's like Ronaldo vs. Messi, Federer vs. Nadal, Ali vs. Frazier and Karpov vs. Kasparov. Masquerade got voted first 18 times. Ambassador is the again the winner of the $3 cost list with a rather comfortable lead over Masquerade by 1.5pp. It has the highest Median and lowest standard deviation. However, it was only voted first 14 times compared to Masquerade's 18. The deck it shuffled once you are through it, so remembering the order of the cards doesnt' help. It turns out that this is true on Dominion Online, as mentioned in the Black Market FAQ, but it's not necessarily true when playing in person. It literally says on the card that the unbought cards go to the bottom of the deck in any order. 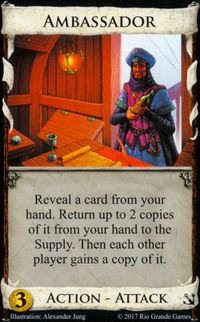 I believe the old Goko/MF client had you order the cards that go to the bottom of the Black Market deck every time. What is going on with Watchtower? I am confused. As a whole, it looks like Adventures did quite well in this half of the list. Also, Watchtower down 10 places? Did I just read that right. Fishing Village is way too high, it should just 1 space above Village really. Ghost Town should perhaps just be 1 space below Village, although it is quite a bit worse so maybe it's okay. But yeah Fishing Village should be like 10 places lower at least. Hermit seems a bit low too, Hermit is crazy! Although the $3's are stacked so good things are going to end up lower than in other lists. Masquerade should maybe be 1, I don't really mind Ambassador over it though, they're both insane. I can see Urchin above Steward but that doesn't matter so much either. Bonfire and Ferry seem a little low, especially Bonfire. Doctor should be much higher, it's really good. Like really, really good. I guess it's low because it's pretty high variance and is unpopular because of that. Enchantress is really high? It's not really that great and a lot of stuff doesn't care/ is made better by the attack. Black Market is also a bit low, you pretty much always go for it. The ability to buy cards and play them in the same turn makes it one of the best payload cards in the game, ignoring all the crazy things you can pull from the deck. Wow this post is a mess! Changeling on 26 seems really high, I've only played with it a couple of times but it seems very weak and situational. But maybe it's just a high-skill card. I'd be lying if I said I could accurately gauge its power level, but it seems like an above-average card to me. 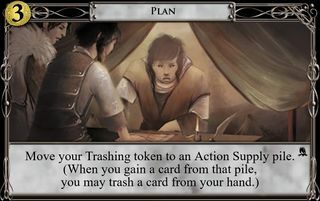 So the next most underrated card after Trade Route is Plan, which is roughly 20 places lower than it should be. I'm not surprised Watchtower took a beating; there are too many boards where it doesn't do much. Enchantress and Catapult didn't deserve the bump, but Chariot Race definitely did. It's often unreliable but usually still worth it. I really haven't been impressed with Changeling. It's great when there's a cheap card/Silver gainer, but most cards don't do that. Absent that trick, it just feels like a non-terminal Feast. It's kind of baffling that Warehouse went down while Dungeon went up. It's true that Warehouse is useless if you have a great deck, but it's still good in the beginning when your deck is junk, and then it's good again when your deck starts filling with green. Anyway, it seems like the same arguments about Warehouse should also apply to Dungeon. I think the two are much closer than the list indicates. Though Dungeon is definitely better in slogs because the duration effect won't make it miss the reshuffle as often. I think Black Market will keep going up. I've only played one game where I didn't buy it, because there weren't any villages and I didn't want too many terminals... And I lost, because my opponent got villages from the Black Market. It's a great card. Actually, it's in engines that Dungeon has the bigger advantage. Alternating Dungeons add a lot of reliability to an engine, because they increase the search space of your starting hand from 5->7 cards. 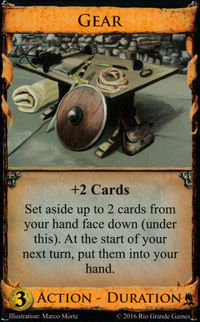 This is especially valuable if your engine needs to pair a village with a terminal draw card to kick off. Dungeon is also a strong opening because it lets you see your other opener more frequently (compared with Warehouse, it usually plays more nicely with your reshuffles). Picking up a second (and maybe third) Dungeon later on usually has a low opportunity cost. Black Market is strong, but it's occasionally too slow. If the kingdom has explosive payload without Black Market - along with the enablers to realize that payload, you might want to skip the Market. Also, hunting for villages or draw in the Black Market is dangerous if there's a fast money strategy on the board (especially if the money strategy can mill Provinces). I can't belive Watchtower and particularly Lookout are this low. 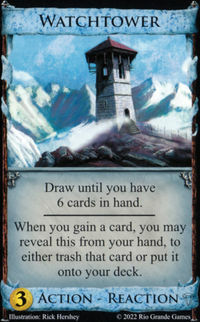 Watchtower is situational but where powerful it's absolutely monstrous. Top-decking gains then drawing them and more with the same card is incredible, and seems possible way more than I initially expected. It's also a great counter to junking and discard attacks! So much use! Lookout is the other kind of good in which it has one use and reliably does it all the time. I'll almost never skip lookout. Obviously donate makes it redundant, and maybe chapel does too, but its non-terminal nature means pairing it with ambassador/masquerade/steward is useful, whereas those three don't play nice a lot of the time. Lookout/Ambassador is a devastating opening. The only reason I skip lookout is donate/chapel or some mad rush game. For me, lookout is #3 and shares the "S-tier" with ambassador and masquerade. Agree that Fishing Village is way too high. 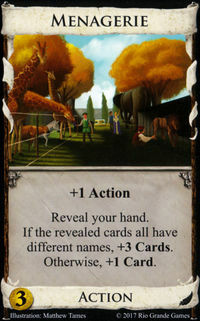 Menagerie deserves to be higher in my opinion. Could replace it with Forager I think. 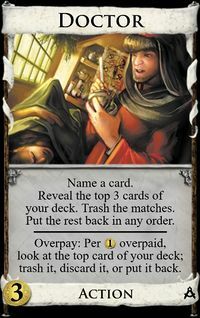 Orange scary card (Dungeon, Gear, Amulet a little) is orange and scary, I need to learn how to play them good it seems..
Lookout is really good but is it so much better than Forager, and Loan? Neither of them takes up an action. Loan gives +1 coin, but cannot trash estates. Forager gives +buy, +0/1 coin early game, but can only trash from hand, and also useful later in the game. Lookout gives only a little cycling, but can trash everything and not from hand. In my opinion, not so much difference in strength between them. Although I'd put Loan a bit higher on the list. Actually Monastery as a 2 cost can really compete with those above. I also think that Fishing Village is overrated but especially Enchantress. The attack usually does almost nothing. Doctor seems really underrated here, along with Menagerie, and the falling Watchtower. Possibly Watchtower was rated higher in the last round because people were swooning about how it pairs with Villa? Well, it's better than Forager. By trashing from your deck instead of your hand, Lookout is essentially a cantrip trasher, and the extra cycling is important and the sifting thing improves your economy on top of that. That's pretty comparable to Loan, but Forager trashes from your hand so it's not as good as the other two. Regarding Watchtower, I think it was overrated because people were playing weaker, less focused decks and Watchtower was great in those since it has positive synergy with almost everything. A lot of the time, its versatility can't compete with the sheer strength of a focused deck, and the focused deck doesn't always have the time for an all-around utility terminal. "Rocks don't get uncovered most of the time"
Seriously, people, just buy more than one Catapult. You can trash extras to hand out Curses! If both players buy two, then there's still one left in the pile. This is backwards. Forager is better than Lookout (when it is better) precisely because it can trash from hand. 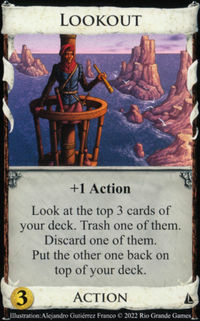 Lookout forever and always has a search space of three cards. Forager has a search space starting at 4 cards, and ending with your entire deck; It's much better at cleaning up the last of your starting cards and dealing with junking before your deck is fully under control. Forager always at least gives back the money from trashing out of hand, so Lookout doesn't have any advantage in economy. On the flip side, Forager sometimes trashes an Estate or Curse/Ruin from hand after a Copper has been trashed, which provides more economy than Lookout. Forager also provides +buy and has the potential to be payload later in the game. Whereas Lookout becomes unsafe to play partway through the game. No, Lookout's one and only advantage over Forager is its cycling. This is an advantage, and it does pair nicely with other cards that can trash out of hand. 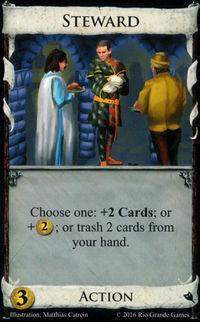 But for me, Forager comes away with more advantages and is the better card. Loan only trashes Copper and isn't really comparable, except to say that it's solidly weaker than these two cards. Moving on. Allow me to defend Enchantress. Yes, the attack is often benign, but not in the beginning of the game. Enchantress is usually a strong opening. The attack is also very painful in combination with a discard attack. 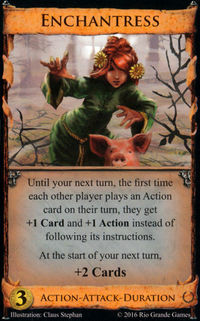 More importantly, Enchantress would be good for the duration draw alone. 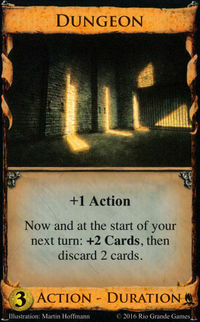 Wharf and Dungeon has taught us the value of seeing two more cards at the start of our turn: it really helps with reliability! It's a rare game where I don't pick up at least a couple Enchantresses. The Forager/Lookout debate is not just about search space, it's about hand disruption. 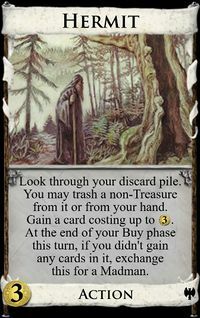 If you're not drawing your entire deck, allowing you to buy something and trash is really nice (one of the reasons Monastery is so good). My big beef with Lookout is the combination of blind and mandatory with its trashing, not a good mix. I would call Sentry a cantrip trasher, but I don't have the energy to fuel a new kind of village/splitter war on words. That's nonsense. 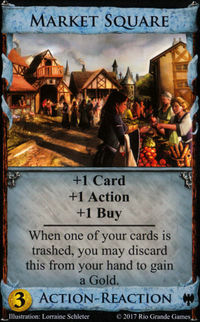 Trashing an Estate from your draw pile for no benefit is better economy than trashing an Estate from your hand for $1. 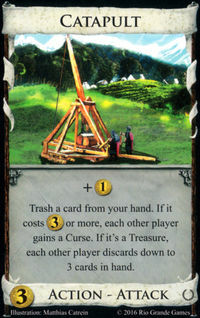 It seems Rocks doesn't get uncovered most of the time because people don't want to open the floodgates by getting the third Catapult in 2P games and letting the other player get first dibs on Rocks. If someone does happen to reveal Rocks, then the real onslaught begins. It's the mere threat of Rocks that further increases the power of Catapult and makes it all the more dangerous to let Catapult overwhelm you. I'm that kind of the player that likes to get the third Catapult to reveal Rocks when I feel my opponent has really gotten battered by Catapults, trashing it with one of my other Catapults at some point. Rocks are basically a way to press your advantage. I go for Rocks maybe 1/3 to 1/2 of the time depending on the village count and the strength of the rest of the board. My experience does not seem to match that of other players. I thought it was standard fare to go after Rocks when there is 1-2 Catapults left, but apparently many players don't like draining the Catapults. It could be that I have been playing too many opponents who are less experienced with Catapult and who do not punish me for going for Rocks. Forager/Lookout is close, but I put Forager slightly higher. It is worse early in the game than Lookout, I grant that, but it has dual utility in giving +buy. That tends to be relevant for the engines it helps you build. Lookout has an often-missed ability to greatly decrease the chance that your other opening buy will miss the shuffle. If lookout turns up T3 then it "rescues" the other buy from skipping if it were going to do so. That, my rough mental calculations suggest, nearly halves the chance of a ruinous first shuffle. 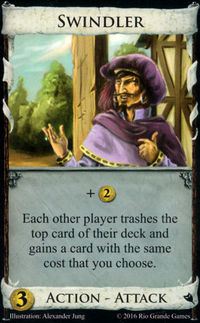 If the other card is something epic like Amb, Masq, Steward, Tournament, Spice Merchant, etc then this is a huge plus. 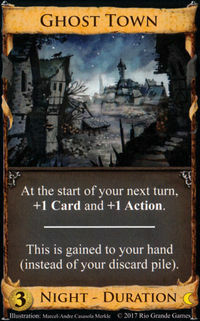 When you play Lookout on turn 3 and your other opening buy is Tournament or Masquerade like you suggested, then playing this card turn 4 will trigger a shuffle which is not the greatest thing because Tournament and your buy on turn 4 (which might very well be a $5er) will miss the shuffle. It's even worse with Page.